What's a spring yard without flowering trees? If you're not already convinced of the beauty that flowering trees lend to a landscape in spring, then I hope my pictures of flowering trees serve that purpose. Indeed, if you're any sort of landscaping enthusiast at all, you'd have to ask the question, "What's a spring yard without flowering trees?" You wouldn't leave your fall yard without fall foliage specimens, would you? But even in cases where I'm preaching to the choir concerning the value of these spring beauties, you'll want to view my pictures of flowering trees for further information about them. For I supplement most of my photos with links to resources that discuss the flowering trees in greater detail. Here's a link to return to my other gallery with pictures of flowering trees if you've come from there and wish to go back. When you hear "apple trees," you naturally enough think "apples". But don't be fooled by their fruit into thinking that apple trees can't be highly ornamental, too, as this picture shows. Sometimes, we're just fortunate enough to enjoy a 2-for-1 deal! Unlike apple trees the popular ornamental cherry trees are grown primarily for their flowers. Among the most popular ornamental cherry trees are the weeping Higan cherry trees. Weeping cherries aren't the only ornamentals with a weeping form. A weeping crab apple tree is shown in this picture. If you're not interested in a crab apple tree with a weeping plant form, there are more traditional alternatives. Among such alternatives are the popular Sargent crab apple trees, some blossoms from which I show in this picture. While weeping cherry trees are very popular, one disadvantage I've found in growing them is that being grafted, they are highly susceptible to pest and disease problems. Kwanzan cherry trees are more reliable. In this photo, you can see the leaves of the Kwanzan cherry tree starting to fill in. 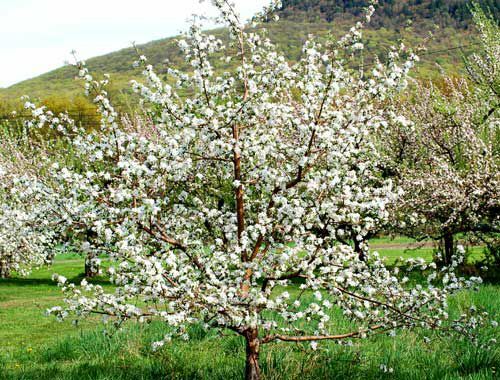 Related to the ornamental cherries are the ornamental apricots, such as the Dawn Japanese apricot trees. This picture of a Dawn Japanese apricot tree wouldn't show the specimen off nearly as well if the background weren't a darker color. For more tips on the use of color in your yard, see my Landscape Color Schemes photo gallery. With their weak limbs, Bradford pear trees are short-lived. And because they're short-lived, Bradford pear trees don't come highly recommended by the pros (despite their popularity with the public). I wouldn't plant one, myself; but that doesn't mean Bradford pear trees don't have their good points. Hawthorn trees, members of the rose family, are related to the other flowering trees we've been discussing so far. One well-known traditional use of hawthorn is as a hedge. But this picture of the plant's lovely spring flowers comes from a hawthorn tree used as a specimen. As you can see from this picture, catalpa trees exhibit surprisingly gorgeous flowers, when viewed close up. However, I don't recommend planting the northern catalpa (Catalpa speciosa, which is shown in my photo; growing zones 4-8) in the landscape. The trees are regarded as rather messy specimens. In autumn, they drop not only large leaves (which are surprisingly unattractive at this time, since they turn black after a frost) but also large "beans" (seed pods). The trees are massive (as much as 70 feet tall with a spread of up to 50 feet, although they more commonly reach a height of 40 feet with a width of 20 feet), so they have the potential to drop this refuse in great quantities. Having one in your landscaping could thus entail significant raking in fall. Potentially adding to their messiness is the fact that the branches are weak, making them prone to damage from winds, heavy snowfalls, ice storms, etc. "Catalpa," incidentally, is both the botanical name and the common name. It is a corruption of "Catawba," which you may recognize as the name of a popular type of rhododendron. Silk trees are fast growers, with leaves resembling ferns and blossoms that live up to the tree's nickname, "silk trees". 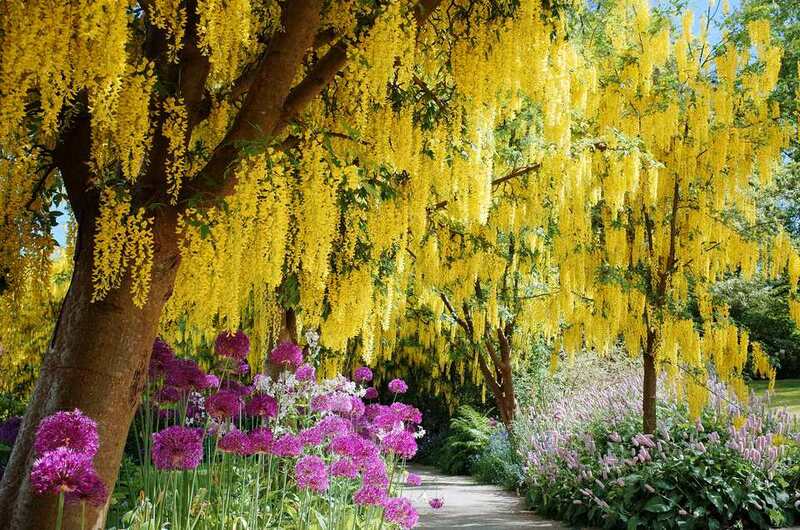 Silk trees bear exquisite, fragrant flowers that bloom all summer. Considering all the fine qualities of silk trees I've mentioned, you may well wonder, "Are silk trees too good to be true?" The answer, unfortunately, may well be yes -- depending on where you live. Silk trees (Albizia julibrissin), also commonly called "mimosa" or "silky acacia," are native to Asia. In some portions of the U.S., they are considered invasive plants. Silk trees have escaped into the wild in parts of the southern U.S. and made pests of themselves. Consequently, like Bradford pear trees and catalpa trees (albeit for different reasons), silk trees are not necessarily desirable specimens for the landscape. Golden Chain: What a Treasure! Golden chain trees aren't as widely planted in my region (New England) as most of the flowering trees discussed so far. This observation seems at odds with the beauty of golden chain trees, which is readily apparent from the photo here. I fell in love with this specimen on my trips to Bar Harbor, Maine, where golden chain trees are omnipresent. I've since planted a golden chain tree in my own yard. Hopefully, it will perform as well in my climate, which is warmer and drier than that of Bar Harbor. Saucer magnolia trees put out fragrant, pinkish-white blooms, which arrive in spring and precede foliage. The flowers of saucer magnolia trees are large (up to 10") -- thus the plant's name. If you live in eastern North America and wish to "go native," serviceberry trees are among your options for flowering trees. Serviceberry trees are early bloomers (late March / early April). From my walks in the woods of New England, I'm most familiar with downy serviceberry trees (Amelanchier arborea). But the picture here shows the Snowcloud Allegheny cultivar (Amelanchier laevis 'Snowcloud'). Serviceberry trees also go by the common names "shadbush," "shadblow" and "shadberry"; these names derive from the fact that serviceberry trees bloom at the same time as the shad (a fish) spawn. Despite the "red" in the name of these flowering specimens, Eastern redbud trees exhibit a pinkish-purple bloom, as the photo shows. As Eastern redbud trees come into bloom in the spring, their bare limbs appear to "fuzz up." It is at this time of year that Eastern redbud trees earn their billing as one of the landscape's most graceful flowering trees. Kousa dogwoods and their Cornus florida relatives are both attractive flowering trees for spring, with knockout fall foliage, to boot. One difference between the American native, Cornus florida and the Japanese Kousa dogwoods is in their berries. Kousa dogwoods bear a larger, rather intriguing berry. But both bear a bloom cluster ringed by four bracts, as in the picture above.